It is generally expected that any great band will always provide a sum much greater than its parts and in the case of Tokolosh, this presents a bigger challenge than most. The Manchester-based outfit are the distillation of Liam Frost’s backing band into a permanent project and considering this includes personnel from The Whip and The Earlies alongside Frost himself, then this should be an exceptional outing. And it is. The themes behind Stay Strong mingle live and electronic instruments well, but it’s the production, song writing strengths and Liam Frost’s resolute and soaring vocal performance that all come up with the goods as promised. This debut album explores a multitude of genres, from pop and soul to light prog and all the way back to off kilter intelligent rock. Hybrid for example is all of these things, with its spaced out effects, brassy backdrop and rock hooks that cycle with a dizzy, hypnotic fervour. 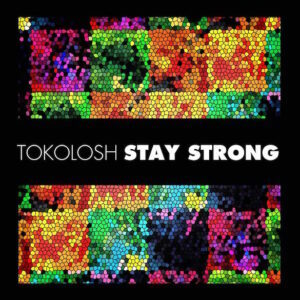 Over the last couple of years, Tokolosh have been quietly releasing a quartet of singles and eight of these tracks are included in this collection of 13 songs. It’s testament that each and every track is worthy of its own billing, with numbers like The Knife Twists spectacular in both melody and an inventive, almost scientifically bundled sound. The album isn’t simply a collection of pop songs however, with The Root providing a perfect example of how disjointed Tokolosh can be whenever they wish; a not surprising side effect of having so many capable musical minds at play. Stay Strong as an album is compelling; the use of atmospheric sounds and the way in which Liam Frost has extended his voice into a much wider field of musical vision is as equally surprising as it is effective. Instead of pandering to the whims of pop music in general, there is a maturity in the songs, hung on authentic and emotional themes and a real sense of experimentalism and space. That it all comes together in such an accessible and moving series of tunes and mini-masterpieces is as fulfilling as the back catalogues of the contributors. This is one of the more interesting UK releases this year and is maybe Manchester’s best foray into providing a landmark sound for 2014. Tokolosh can be found on Facebook, Twitter: @wearetokolosh and online here: wearetokolosh.com. All words by Jon Ashley. You can read more from Jon on Louder Than War here.